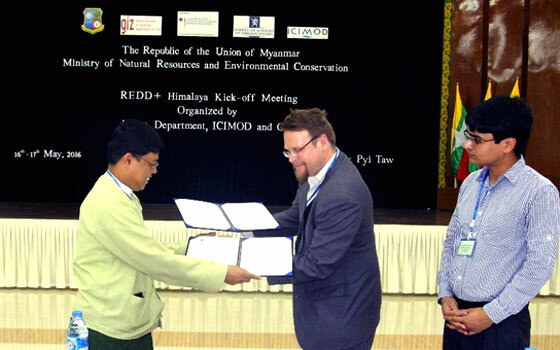 The initiative was formalised with the exchange of Letter of Agreement between the Forest Department, Ministry of Natural Resources and Environmental Conservation (MONREC), Myanmar, and ICIMOD. 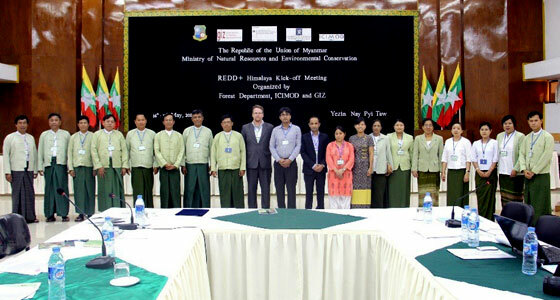 In Myanmar, the project will support the national Road Map of REDD Readiness by implementing different activities under the overall umbrella theme of Gap Analysis and Capacity Development. The country specific objective of the REDD+ Himalaya programme in Myanmar is to develop capacity of REDD+ stakeholders and to develop instruments in preparation for REDD+ Readiness by undertaking and identifying gaps in the readiness phase. Delivering his congratulatory remarks during the inauguration ceremony of the event, U Bo Ni, Director of the Watershed Management Division, Forest Department, MONREC expressed his appreciation for ICIMOD and GIZ for the long-standing cooperation with the Forest Department and concerted efforts for organising the meeting. 'This meeting indeed reflects our determination and commitments to further strengthen and promote our cooperation for REDD+ in the Himalayan Region’, he added. Representing ICIMOD and GIZ, Mr. Kai M. Windhorst, Chief Technical Advisor, said that this formality of the Letter of Agreement is to be cherished as it brings a commitment for all the partners in successfully implementing the programme with a common objective. Mr Windhorst stressed that understanding how forests are seen in a society, can generate wealth in a society. 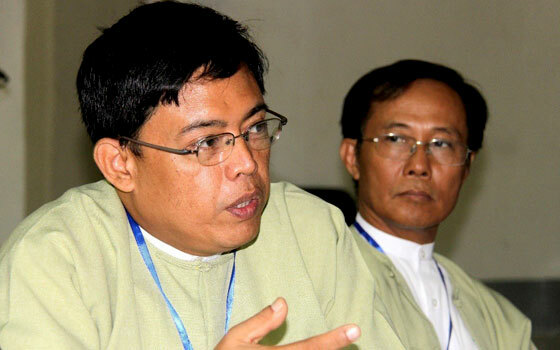 'REDD+ is a cross sectoral financing mechanism, nonetheless the context of REDD+ in Myanmar is currently known best by FRI, of the Forest Department’, he said. 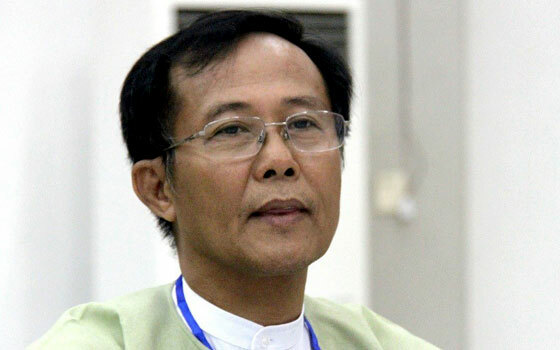 In his closing remarks, Dr Thaung Naing Oo, Director of FRI, congratulated everyone involved for successfully organising the kick-off meeting in Myanmar. 'I think the meeting was very fruitful, and we at FRI acknowledge REDD+ as an important initiative linking practice and policy’, he stressed. The meeting was successful in coming developing a work plan amendment and budget revision, in close cooperation and agreement with the FRI and ICIMOD team. The fund disbursement mechanism of the programme was also shared with the administration and finance team of FRI. The team from ICIMOD took the opportunity to re-orient the concerned programme staff of FRI on the REDD+ Knowledge Management and Communication Strategy to make sure that the research knowledge and outputs are well documented, managed and communicated in time, to relevant stakeholders.